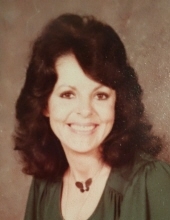 Jessie E. Mellott Mason, 78, died peacefully Wednesday, January 16, 2019 at her daughter’s home where she was surrounded by many who loved her. She was born Nov. 20, 1940 in Lewis County, Kentucky to the late Bruce and Chloie (Dyer) Armstrong. Early in life, Jessie was married to Frank Fannin and, even though their marriage didn’t last, they had five children together. She eventually settled in Bucyrus where she worked at Swan Rubber for a short time. In 1970, she was introduced to Harold E. Mellott and on August 21, 1971 they married, and had a son J.R. They created nearly 20 years of memories with their children, traveling to various locations, and did a lot of camping at Indian Mills resort before his unexpected death in 1990. They were also both very involved at Marion Enterprise Baptist Church. Several years following Harold’s death, Jessie and her sister spent a portion of a winter in Florida. While there, she met Robert Mason who was vacationing from Sarnia, Ontario, Canada. They married in 2001 and lived in both Sarnia and Bucyrus. While in Sarnia, they enjoyed a lot of fishing and while in Bucyrus, they socialized with friends and family. Bob died in 2011. Jessie was into crafting and she liked to make old things look new. She had a knack for restoring antiques and even reupholstered a couple campers. It was important that her home look nice inside and out and, in regard to mowing, when she finished her lawn, the sidewalks and streets were always neatly swept. Jessie loved her neighborhood and could often be found outside chatting with a neighbor or two. She loved when her children and grandchildren would visit and the family reunions at Aumiller Park were fun times. Jessie was a beautiful lady but wasn’t shy about being straight forward with folks. She had quite the sense of humor which was sometimes lost on others. If she were out and about, she never left home without Bobby, her furry four-legged companion. For relaxation, Jessie would often glance through photo albums or watch Fox News and she never turned down a bowl of ice cream or a Reese’s Peanut Butter Cup. She will be deeply missed by her three children, Fonda Moore, Richard Fannin, and J.R. (Michelle Cochran) Mellott; four stepchildren, Judy (Mike) Hoffman, Nancy Eisenhard, Pamela (Galen) Tipping, and Lisa (Michael Craddock) Mellott; numerous grandchildren and great grandchildren, various nieces and nephews as well as one sister, Carrie Hobbs. In addition to her parents and husbands, Jessie was preceded in death by three sons, Danny, Bruce, and Gordon Fannin; a grandson, Kevin Alt; two brothers, Harold and Leslie Armstrong; five sisters, Pauline Clouse, Lorain Cooper, Annie “Elmas” Butler, Shirley Clouse, and Connie Fannin; son-in-law, Roger Moore; and daughter-in-law, Keneda Parker. Her family will receive friends from 2-6 pm Sunday, January 20 at Wise Funeral Service where her funeral will be held 11:00 am Monday with Gary Schiefer officiating. Burial will follow in Oakwood Cemetery. Donations can be made payable to Debbie’s Footsteps or to amfAR (The Foundation for AIDS Research) and these donations will be accepted through the funeral home. Photos and memories are encouraged to be shared with others by visiting her Tribute Wall. To send flowers or a remembrance gift to the family of Jessie E. Mellott Mason, please visit our Tribute Store. "Email Address" would like to share the life celebration of Jessie E. Mellott Mason. Click on the "link" to go to share a favorite memory or leave a condolence message for the family.